This is again the season of eternal love between brothers and sisters! This is the season of Rakhi or Raksha Bandhan. This festivity is marked as the lifelong bond between the brothers and sisters. The commitment to be always by each other’s side is made as the sister ties Rakhi on her brother’s hand. Rakhi or he Holy Thread is the main item on this festivity and every sister is seen exploring the market to get the best Rakhi for get brother. Let us checkout some of the most popular Rakhi for the season. This kind of Rakhi is quite different from the traditional flower shaped Rakhi. The holy threads are embellished with white or red stones adding a sparkle on your brother’s wrist. This kind of Rakhi perfectly matches the grandeur of the festival and goes aptly with traditional dresses like sherwani and kurta. Red Kundan with White Stones Rakhi and Rounded Colorful Stones Chain Rakhi are the most popular Rakhi under this category. Rakhi is just not a thread but a symbol of good wishes. Just do not tie a Rakhi on your brother’s wrist this year but also let the divine blessings be with him through the years to come. 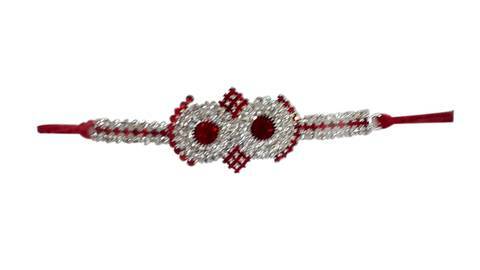 The White Stone with Swastik Thread Rakhi and Diamond Shape with White and Red Kundans Rakhi serve the purpose; Swastik is the sign of good omen and is considered sacred as per Hindu mythology. While Rakhi is a one day festival, the holy thread adorns the brother’s wrist for a long time. 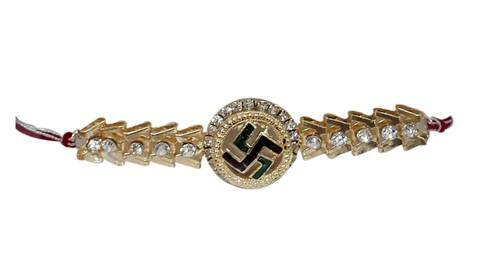 Keeping this in mind this year saw the introduction of a new type of Rakhi, the jewelled Rakhi. These Rakhi are made with golden beads and moti. The Gold Beads Rakhi and the Gold Plated Pearl and Stone Rakhi are some of the exquisite pieces which are a must try this festive season. These Rakhi come with a classic look and can be easily worn to office. The use of high end metal, stone and kundan give these Rakhi a shiny look for a long time span. The White Stone Border with Gold Colour Bracelet Rakhi can bring a smile on the face of your brother. This Rakhi looks no less than a golden bracelet and can be a perfect match to any traditional party wear. The bracelet Rakhi is made with high uppity crystals and can be worn on any occasion. So this Rakhi is just not a token of lover on Raksha Bandhan but also a memoir of sweet love and bonding that can stay with your brother till you find a new, unique Rakhi for your brother the next year! Is your brother an ardent devotee of Lord Shiva? If the answer is yes, this Rudraksha Rakhi can be the best type for him. Elegant yellow in colour, this Rakhi is the best way to wish your brother health and wealth on this Raksha Bandhan. These days you can get all these stylish Rakhi online. These are available as a set, that is, a Rakhi along with dry fruits and chocolates and can be sent directly to the recipient. So why wait? Wherever you are get the best Rakhi for your brother from the ease of your home.